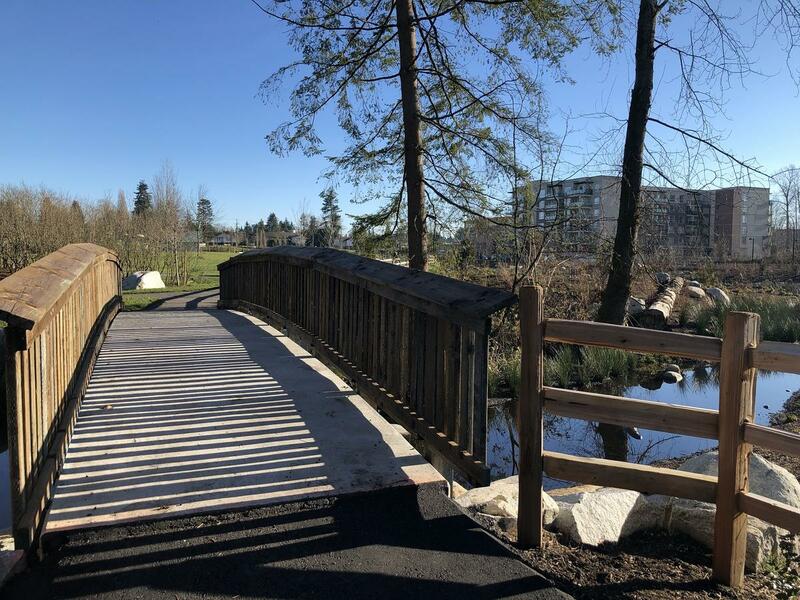 Early last year, work began on the 105 Avenue Connector and Hawthorne Park Improvements project. 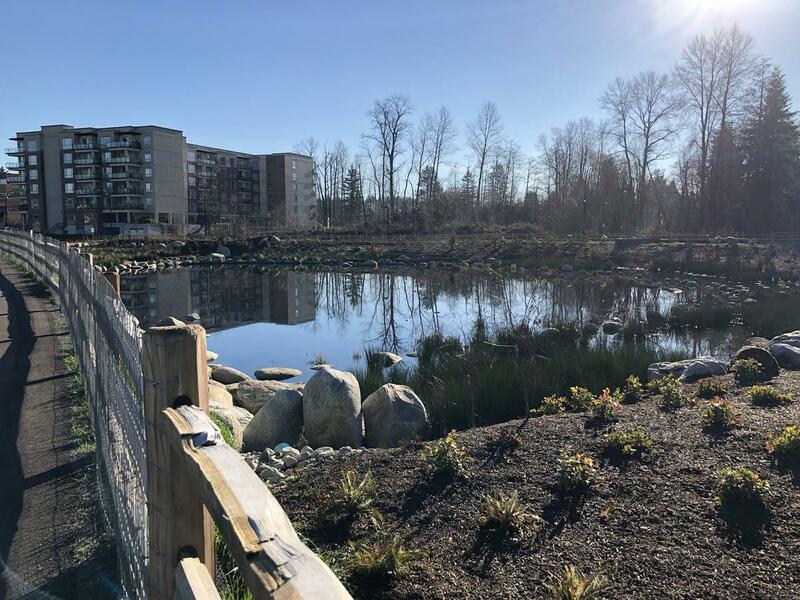 The purpose of the project was to improve connectivity between City Centre and Guildford through a new multi-modal collector road, as well as deliver numerous improvements to Hawthorne Park – including improved accessibility, a new aquatic habitat, and increasing the park’s overall size. 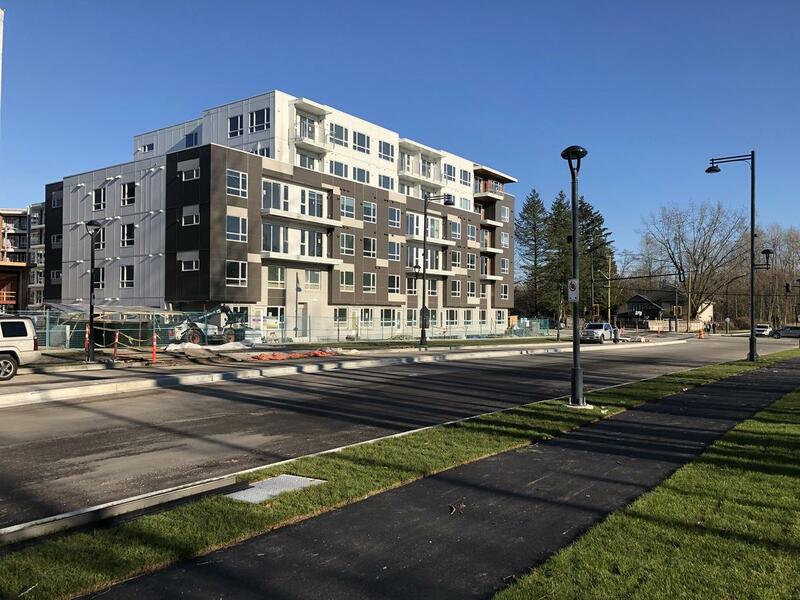 Since then, Phase 1 of the project, including the 105A Connector between Whalley Blvd and 144 Street has mostly completed, with some finishing touches remaining between 139 Street and 140 Street. 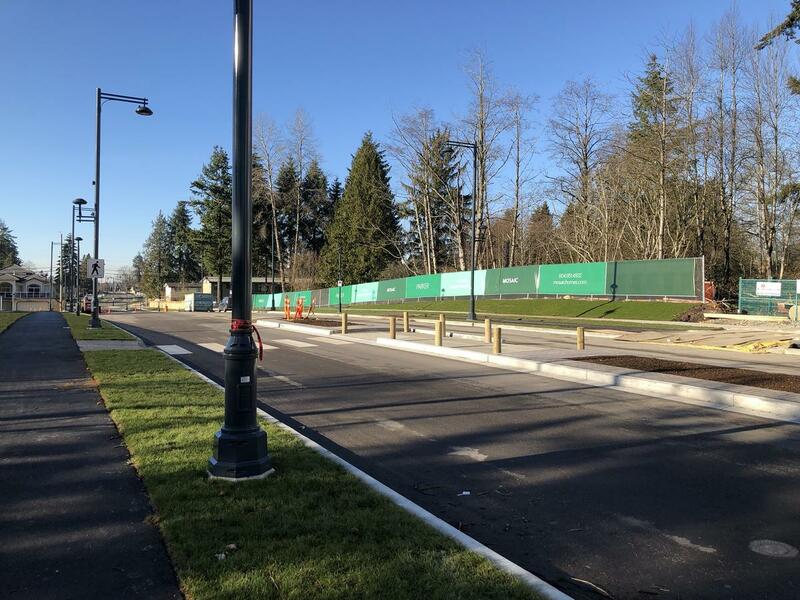 The new 105A Avenue is a multi-modal corridor featuring 2 vehicle lanes, grade separated bike lanes, sidewalks, boulevards, fencing, and enhanced pedestrian-oriented street lighting. 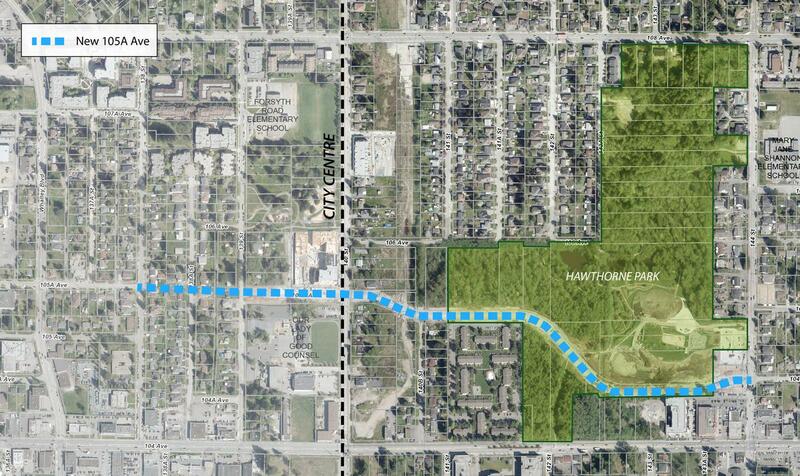 The route offers pedestrians and cyclists a pleasant alternative to 104 Avenue, skirting the edge of Hawthorne Park and continuing west past 140th Street into City Centre. Below is a small photo tour of the new 105A and park improvements. Or take a visit for yourself! 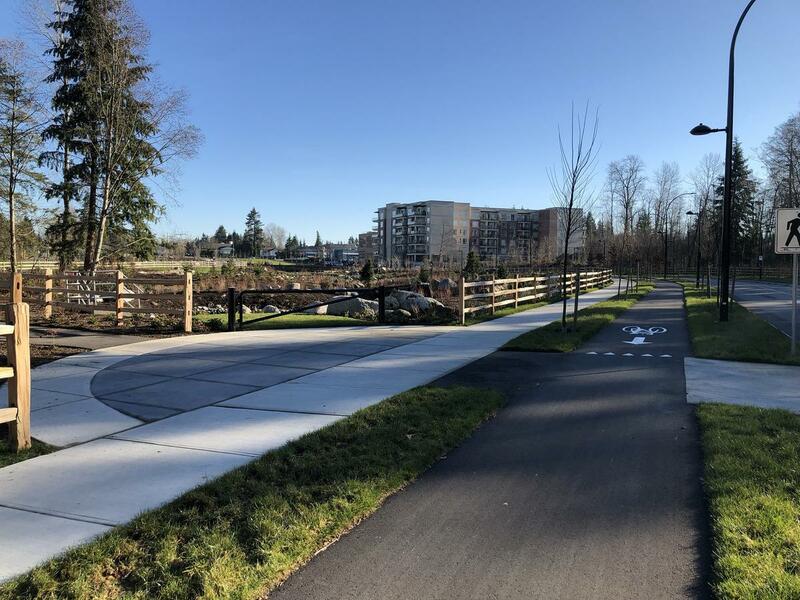 It was misreported this week that hundreds of trees were cut down in Hawthorne Park for light rail transit after drone footage was posted to YouTube showing tree clearing for a new extension of 105A Avenue. 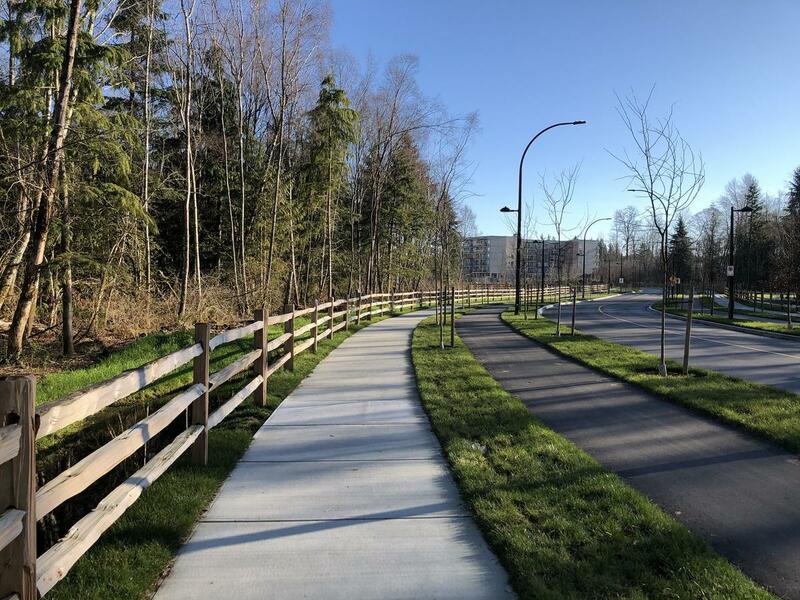 The clearing was actually for the 105A Avenue connector project itself – which has been planned for 30 years – and is independent of, and pre-dates the LRT project itself. The new road is however being fast-tracked in advance of LRT, to provide a relief route for traffic once construction begins on 104 Avenue. The road was planned to be constructed regardless of whether LRT, SkyTrain, or no rapid transit was planned at all for 104 Avenue. 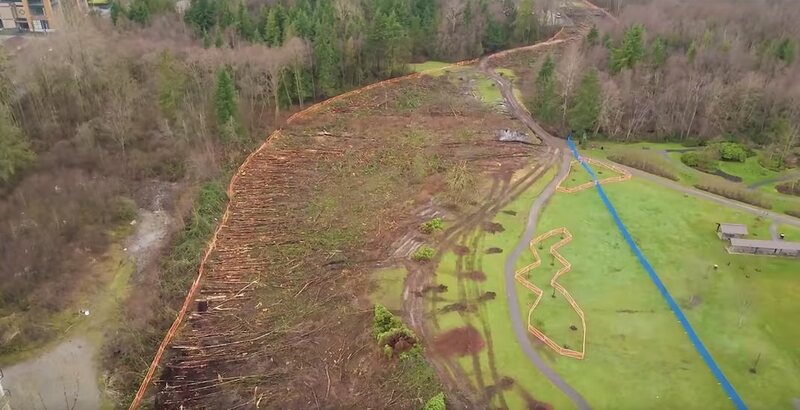 In the drone footage and captured images – a large clearing of trees is shown giving the dramatic impression of a clear-cut of the park to make way for the new road (or LRT if you’ve been mislead by headlines). 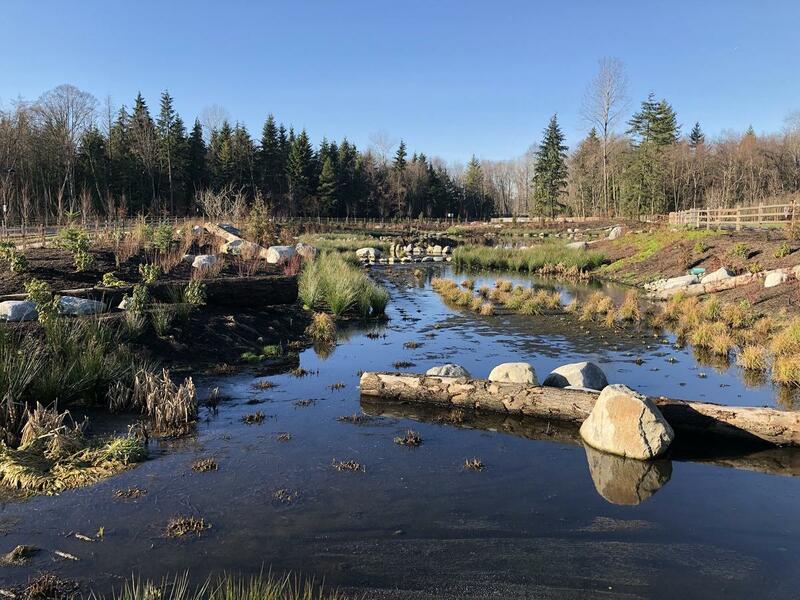 The reality is, this cleared area only represents a small fraction of the park’s vast forested area, and the road itself will only consume a narrow 2-lane wide portion of this, with the remainder to be used for a new aquatic habitat and enhanced environmental area. 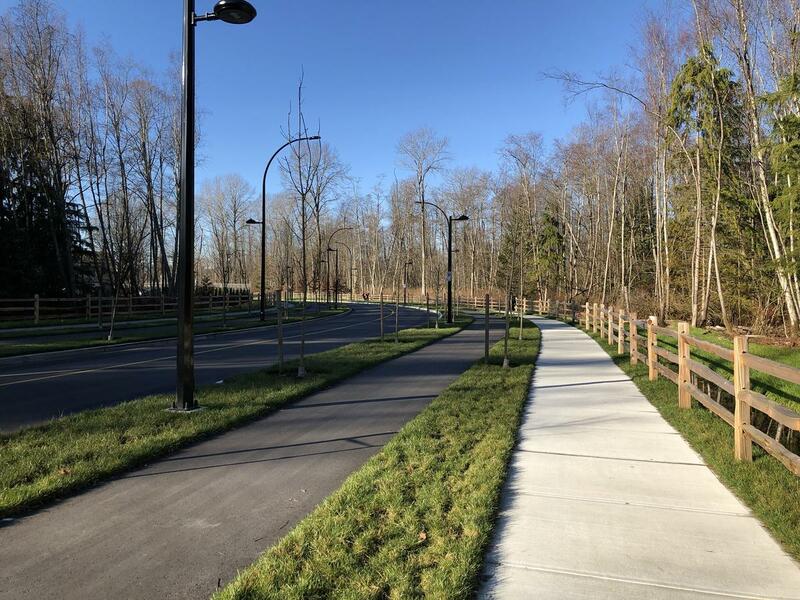 The cleared area also skirts the edge of undeveloped treed lots to the south – giving the impression of cutting through the middle of the park in this area – when in fact the road runs along the edge of the park. Captured image from drone footage showing clearing along southern edge of Hawthorne Park. 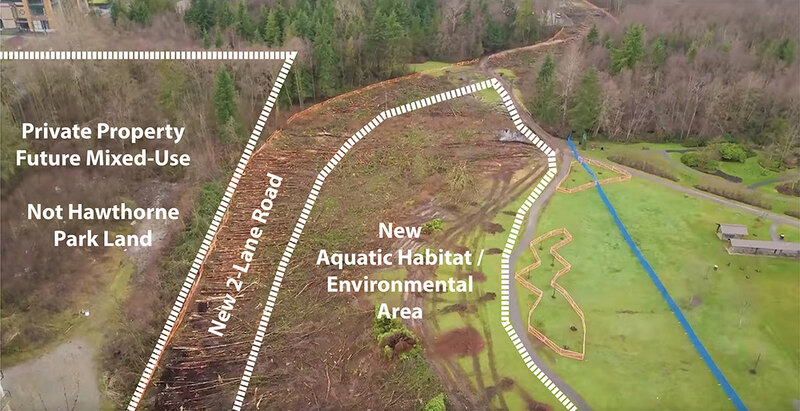 Cleared area in perspective – majority to be used for new aquatic habitat/environmental area. Lands to south are private property outside park designated for future mixed-use. While the tree clearing for western portions of 105A Avenue does cut more through the park rather than skirt the edge – when put into perspective – this cleared area pales in comparison to the remaining forested lands preserved elsewhere in the park. 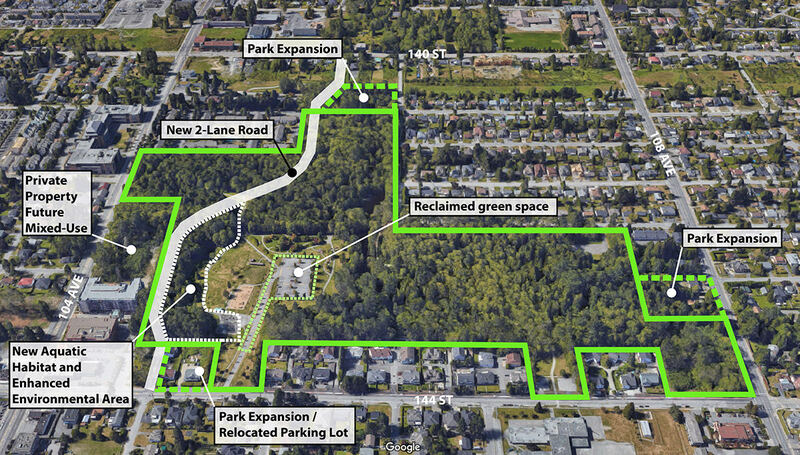 Further to this – planned expansions of the park, reclaimed green space from relocating the parking lot, and the new aquatic habitat and environmental enhancement area more than offset the impacts of the minor 2-lane collector road that is to be constructed – not to be confused with an arterial road as misreported by the Daily Hive. 105A connector routing through the southern edge of Hawthorne Park in perspective. Vast majority of park to be preserved, expanded, and enhanced. 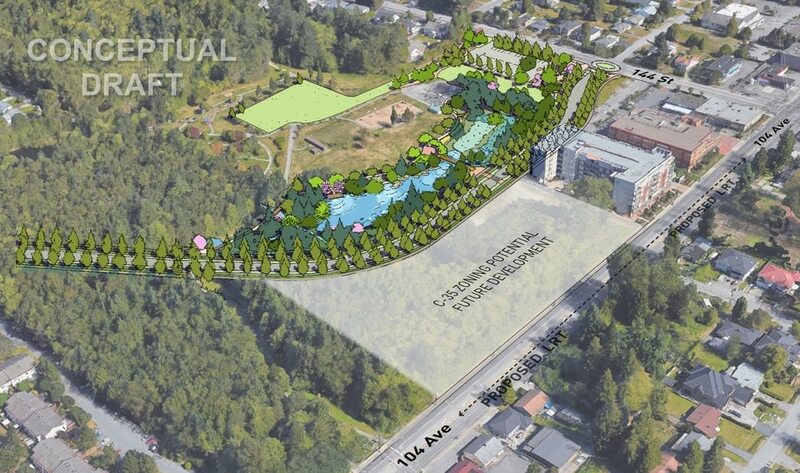 Artist rendering of new 2-lane 105A connector and new aquatic habitat, environmental enhancement area, and future development site south of 105A Avenue outside of Park. 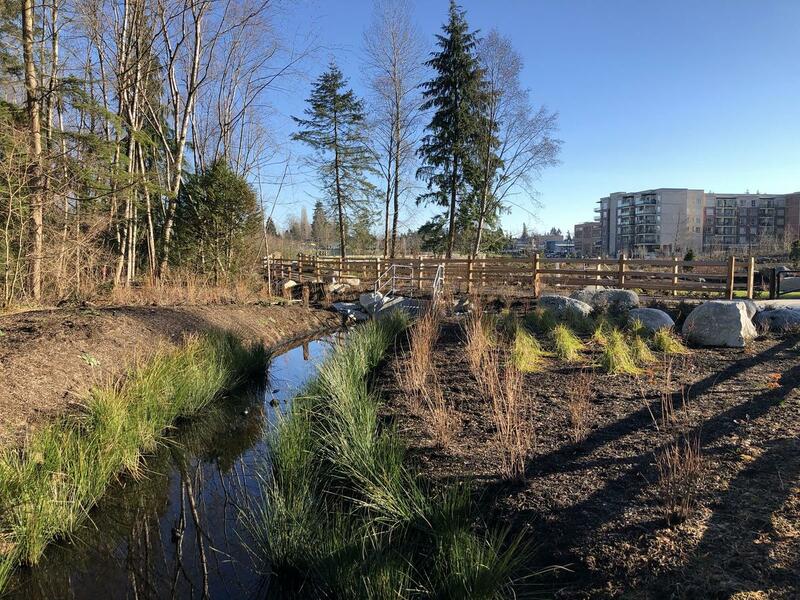 Artist rendering of new 2-lane 105A connector along edge of Hawthorne Park and new aquatic habitat, environmental enhancement area, and relocated parking lot/reclaimed green space. The new 2-lane road (planned for 30 years) will not only add much needed east-west capacity to Surrey’s road network between densifying City Centre and Guildford, but also improve accessibility to Hawthorne Park – better integrating it with its evolving urban context, with new gateway features, pathways, and entrances – which will result in more people using and enjoying the park. Today, it remains a largely hidden, underutilized, rural park from a previous era, that is easy to pass by without recognizing it is even there. 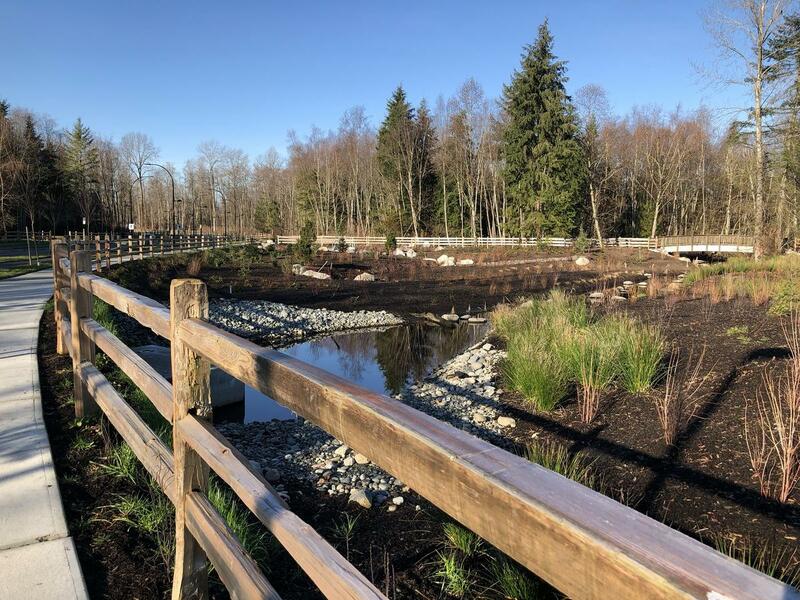 It is important to realize, that a road through a park isn’t the end or destruction of Hawthorne Park or a call for protest, particularly when so much value and improvements will be added to offset the impacts. Many world renowned parks have roads through them, and are doing just fine. And the list goes on.. and on. 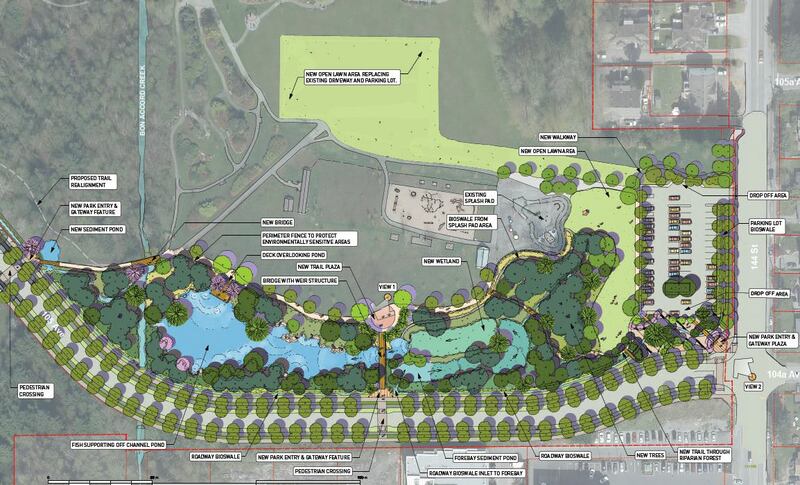 Hawthorne Park will live on, and emerge even better than before.